May 21/June 3 -- "Oranskaya Vladimir", "Vladimir-Krasnogorsk"
"Oranskaya" Vladimir Icon of the Mother of God appeared in 1634 under the following circumstances: Peter Gladkov, a major landowner in Nizhegorod nurtured a great reverence for the Vladimir Icon of the Mother of God in the Dormition Cathedral in Moscow. He ordered a copy of that icon and had it brought to his homeland. Several years later, in a dream he was shown a hill, and instructed to build a church dedicated to the Vladimir Icon at its summit. Going off in search of the designated site, Peter stumbled upon a place over which a light shone, deep in the heart of the forest. Gladkov recognized Slovenskaya Hill as the hill shown to him in his dream. Upon relating everything to Patriarch Joseph, he received a certificate authorizing construction of a church. Peter erected a marble cross on the hill, and began construction of the church, in which the Icon of the Mother of God was later installed; the Icon acquired the name "Oranskaya," and before it, miracles began to occur. Tsar Mikhail Fyodorovitch directed that a monastery be established next to the Church. In 1603, during the reign of Boris Fyodorovitch, there was an abbot named Varlaam, who served in the Church of the Resurrection of Christ in Kevrol, on the bankss of the Pineg river. He was inseparable from the Vladimir Icon of the Mother of God, to which he had a great devotion. In old age, he decided to bequeath it to a certain Khariton, a fool for Christ whom he considered to be a pious man. Once, upon returning to his cell after Matins, Varlaam had a dream, in which the door of his cell opened, and he heard a meek woman’s voice asking “Elder, why do you wish to give the Icon of the Most-pure Theotokos to an unskilled man? Better give it to the widowed Priest Myron. God wants to glorify Chornaya Gora [Black Hill] through the Icon.” The abbot awoke and although he believed the vision, he could not understand: Who was this widowed priest Myron? Then, by God’s providence, a priest named Myron, who served in the village of Yurola, a village less than two miles from Chornaya Gora, came to collect the diocesan taxes. Abbot Varlaam began to inquire about Chornaya Gora. The priest answered “There is such a hill, but it is uninhabited. 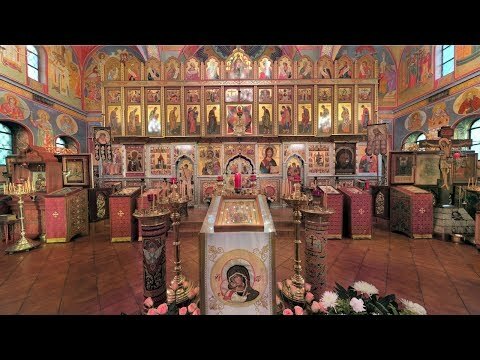 I believe it would be a place appropriate for monastic life, and I believe that the Lord will not abandon it.” The abbot told him of his vision and brought him before the Vladimir Icon in the church. Putting on his priestly vestments, the abbot served a moleben to the Mother of God, praying with tears before her Icon, and then gave it to Priest Myron. With his own hands, he wrote on the back: “Through God’s mercy and the prayers and apparition of the Most-holy Mother of God, Abbot Varlaam of the Church of the Resurrection, Kevrol district, blessed the widowed priest Myron with this Icon of the Most-pure Theotokos, and according to her vision, directed the building of a hermitage on Chornaya Gora, from which the Icon came. Priest Myron took the icon, returned home, and placed it in the church in the village of Yurola, where he also remained; the deep snow and winter season prevented him from ascending Chornaya Gora. Soon, a miraculous sign was revealed through the Icon. In the village of Tsymbola, there lived a maiden named Martha, who through disease had lost her sight. Once in a dream she saw Priest Myron come from Kevrol, bringing with him something long-forgotten which healed the eyes. When priest Myron was told of the vision and of the blind girl’s request to help her by bringing her what had been long-forgotten, he understood that it was the icon to the Mother of God. At his order, they brought the blind Martha to the church, and he began a moleben before the icon of the Mother of God. Immediately, Martha received healing, and regained her sight. Some time later, the healed Martha had a vision in which she saw the Icon of the Theotokos and heard from Her the direction that she tell priest Myron that he must obey her will and take the Icon to its appointed place: “It is my wish that a house should be built for me there, and that there my name should be glorified.” Martha told of her vision, and priest Myron immediately and reverently carried the Icon to Chornaya Gora. He erected a cross to bless the site, made a shelter of boards and installed the Icon within it, served a moleben, and returned home. From that time on, he would frequently visit Chornaya Gora to pray, and finally he began to clear ground for a dwelling. With the onset of winter, his visits ended; throughout the entire winter, the Icon of the Mother of God remained on Chornaya Gora. A certain experienced and skilled monk named Jonah, fleeing from the troubles brought on by the first usurper [of the throne], left Moscow for the coastal lands. Coming to the banks of Pineg, in the vicinity of Kevrol, he stopped at the village of Chakhol, finding lodging with a pious peasant named Yevthimy. Exhausted by his journey, Jonah fell asleep. In a dream, he saw himself finding the Vladimir Icon of the Mother of God, taking it, wrapping it in a cloth, and putting it under his shirt. This dream amazed monk Jonah, and he immediately left Chakhol for Bakhtev Gora, and while staying with a local resident named Nikiphor, began to inquire about desert places in the area. Nikiphor suggested that uninhabited Chornaya Gora was the likeliest setting for a monastic life. Going further north, Jonah came to the village of Pilye Gori. There, in a dream he saw a beautiful woman approach and tell him “ I am called Paraskeva. Do not struggle in vain, O elder, to become a hermit. Rather, go to Chornaya Gora, about which Nikiphor told you. There priest Myron wishes to build a church dedicated to the Most-holy Theotokos.” Upon saying these words, she gave him a loaf of bread. Soon Jonah went to the village of Vonga, where he began to ask about Chornaya Gora. The villagers told him the way to the very hill, and said that a cross already stood upon it. Continuing on his journey, Jonah came to Yurola and, having served the Typica, sat down to rest in the church narthex. Priest Myron entered into conversation with him and learned of the reasons for his leaving Moscow and of the visions he had seen. At this same time, the same Abbot Varlaam to whom the Vladimir Icon had belonged, came to Yurola to collect diocesan taxes. They told him of the miraculous healing of Martha, and of all of the apparitions which had occurred. A certain Evfimy overheard this, and added that long before this, while on his way from the village of Maletin to Yurola for the Thursday of the Great Canon during Great Lent, he had seen a pillar of fire stretching to the heavens from the ground on Chornaya Gora. Then, a certain Gregory added that in a dream not too long ago, he had seen an icon of the Mother of God known as the Tenderness - Vladimir Icon, standing surrounded by many candles, upon a high hill, with priests dressed in their vestments and singing molebens, while a multitude of people were gathered around the icon. A certain John Noskov said that he too had seen that hill in a dream, and that Tsar Fyodor Ivanovitch walked about the hill and pointed out the spot. Residents of Yurola and other places came and told of how, while hunting, they had heard loud bell-ringing on Chornaya Gora; boys who grazed sheep on Chornaya Gora corroborated the story. All of these visions and precognitions clearly indicated God’s good will towards the site. Abbot Varlaam advised them not to delay in performing good deeds. He tonsured priest Myron into the angelic habit with the name Makary, and by consensus sent him immediately to Moscow to Tsar Vasiliy Ivanovitch, to request a place for the building of a church on Chornaya Gora. Monk Jonah remained in Yurola and with the coming of Spring set out for the place on Chornaya Gora where the Cross had been set. He prayed before the Icon, and together with other strugglers began to clear land and to fell timbers for the building of a church. He built a cell for himself not far from the Cross, and began to till the soil. One day, as he was discussing with one of the workers where to place the foundation of the church, they suddenly heard bell ringing coming from the clearing. First one bell, then, two, then many. They went to the place from which the sound was emanating, but there they saw no one and heard nothing. Some time later, they summoned from the hamlet of Volok-Pinezhski Hieromonk Mitrophan and other priests who came with icons and crosses, and laid the foundation for the Church dedicated to the Praise of the Mother of God. However, they lacked an experienced carpenter to build the church. Jonah, greatly saddened by this, did not cease praying about it. His prayers were answered. The Most-holy Theotokos herself showed concern for her home. In the Korelsk land there was a man named Chakov who became so gravely ill, that his internal organs appeared ready to fail, and his throat became very swollen. Chakov prepared for death. However, in a dream, a beautiful woman appeared to him and with a sea sponge in her hand, began to wipe his throat. Then she said. “Go to Chornaya Gora where you will receive complete healing.” Waking from his dream, Chakov felt that larynx was healthy, and immediately departed for Chornaya Gora, where he did receive complete healing. He was experienced in building churches, and immediately began to build the church on Chornaya Gora. By Summer’s end, the church had been erected. At this time, Makariy returned from Moscow with a grant from the Tsar, permitting the building of a church and monastery on Chornaya Gora. In the Spring, he departed for Novgorod to obtain from Archbishop Isidore an antimension and blessing for the consecration of the church. Hearing of the miracles flowing from the holy Icon on Chornaya Gora, Isidore glorified God, blessed Makariy to be an abbot, and gave him the pastoral staff, explaining that it was inconceivable that such a place be without an abbot, especially since there was no other monastery on the river Pineg in the Dvina region. He presented him with a grant blessing the establishing of a community, supplied him with an antimension and necessary church plate, and then blessed him to go in peace. Makariy returned toward Autumn, and found that the church had already been completed. In 1608, having called together the priests from the area, Makariy consecrated the church to the Praise of the Most-holy Theotokos. They named the newly-founded monastic community the Krasnogorsk [Beautiful Hill] Monastery. The carpenter Chakov accepted monastic tonsure with the name Joachim. Many other pious ones were tonsured with him. The miracles which flowed from the Icon of the Most-holy Theotokos brought renown to the monastery. In the settlement of Tsymbola, there was a pious woman named Irina. Inspired by a vision, she came to Volok Pinezhsk, and asked priest Gregory to have a procession of the Cross to Krasnogorsk Monastery, and there to serve a moleben before the Icon of the Theotokos. The priest did not heed her words. Immediately there was an awful change in the weather. It became so cold that all of the crops were about to freeze. Gregory himself was struck unconscious on the Church solea by some invisible force. Slowly coming to his senses, he rushed, accompanied by icons and crosses, to the new monastery, where he served a moleben before the icon of the Mother of God. Then the weather turned warm and pleasant. At around that same time, the government sent a certain Ioann Miliukov from Moscow to administer Kholmogory. During the time of troubles and usurpers, the populace often turned against its authorities. So it happened in Kholmogory. They cast Miliukov into a dungeon, and condemned him to death. His spiritual father recommended that he turn for help to the Most-holy Theotokos, who had worked great miracles through Her Holy Icon on Chornaya Gora. Miliukov entreated the Mother of God, praying fervently to her the entire night. In the morning, the populace repented, and asked him to once again assume his office. Miliukov glorified God, and to the end of his days maintained his reverence for the Most-holy Theotokos and contributed generously to the Krasnogorsk Monastery. The Nicene Icon of the Mother of God was glorified in the year 304 AD. During a siege visited upon the city of Nicaea , Asia Minor, by Amir, a certain man named Constantine saw the Icon of the Mother of God, grabbed a stone and threw it at the Icon, and then began to trample the Icon underfoot. That night, the Theotokos appeared to the sacrilegious one in a dream and said, “You have done me a great outrage. Know that you have done it unto your perdition.” His punishment quickly ensued. During a battle, he was suddenly struck on the head with a stone, and fell dead. The account was related to the fathers of the First Ecumenical Council (325), who then directed that the Theotokion hymn “Thy Womb is the Holy Festal Table” be sung before that Icon. In the town of Rybinsk, in a monastery chapel erected near the Rybinsk-Bologovsk Railway station, there used to be an ancient miraculous icon called "The Non-slumbering Eye." 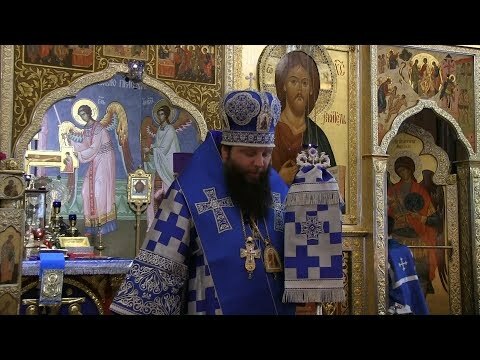 It had been donated to the chapel by the daughter of the famous preacher Archpriest Rodion Putiatine, who as the result of family traditions had particular reverence for the icon. The image, painted in the Italian style, was done on canvas mounted to a wooden board. The Most-holy Virgin is depicted at waist-length, seated at a table; on the left side of the room, there is a raised dark green curtain. The Theotokos head is covered with a white scarf, with hair visible below it. Her immaculate face and her mournful gaze are directed downward, to the Divine Infant, Who is lying on the table. Her left arm rests against the table, with the left hand supporting her head, while her right arm supports the sleeping Divine Infant. The Pre-eternal One’s eyes are closed, and His head is turned to the right. His right hand rests on the right arm of the Mother of God, and his left on the bent knee of His left leg; His midriff is covered by a white taffeta cloth. At the bottom of the Icon there is an inscription: "I sleep but my heart waketh." (The Song of Songs 5:2) The inscription bears witness to the fact that the Icon’s name, "The Non-slumbering Eye" has a symbolic meaning. It points out that the Savior and His most-pure mother are always consciously looking after our salvation. renowned since the year 792 as miraculous. The Icon was taken from the cemetery church to Usvyat itself, where it remained, in the Holy Transfiguration Church until 1917. Both written documentation and oral tradition bear witness to many miraculous signs and healings flowing from this Icon. A major cholera epidemic appeared in 1859 in Usvyat and its surroundings. Every day, many people became sick, and many died. Having lost hope in any human assistance, the people turned to the Queen of Heaven. Carrying the Miraculous Icon of the Mother of God with profound faith, they made a Procession of the Cross around the afflicted area, and as one, raised up fervent prayers for her intercession. That very day, and to general rejoicing, the cholera began to abate. The next day, another Procession of the Cross was made by the entire populace, and from that point, the plague of cholera ceased. The "Tsesarskaya-Borovskya" Icon, written in ancient Russian style on a board measuring 88 cm. by 62 cm., is framed in a silver oklad adorned with gilded crowns and precious stones. An inscription on a gilt plaque expresses the thanks of the people of Usvyat for the Most-holy Theotokos’ intercession in saving them from cholera.